It may be useful to examine the process of addiction and the stages that a person goes through when trying to make changes in their lives. When a person is using drugs they go through a number of stages. These stages are known as the process of addiction. Most families when they discover they have a family member using drugs have no idea of what is going on for the person using or where they are at, at any given time. We have found that a useful way for families to understand this process is by using the Wheel of Change. 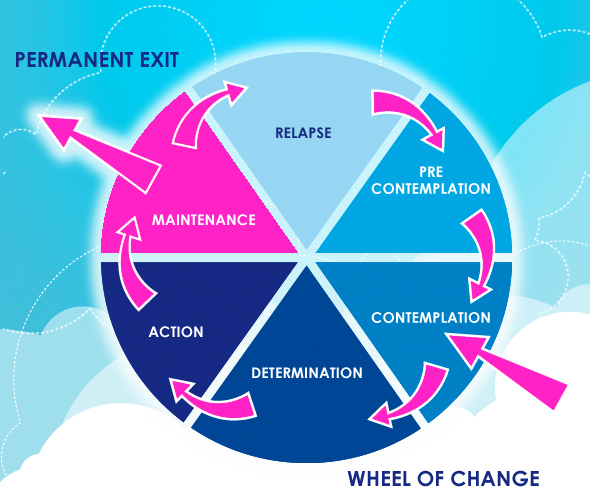 The Wheel of Change was developed to form an understanding of how and why people change risky behaviour either on their own or with assistance. It illustrates the cycle that many drug users undergo and can help families understand how difficult it is to conquer addiction. The Wheel of Change has six segments. Each segment corresponds to a particular stage of the cycle. There is no one speed at which people move from one segment to another, but they generally follow the cycle. We have also found that the Wheel of Change helps us as family members deal with the effects of drug use. Often at this stage a person is not aware or concerned that their drug use is an issue. It would appear to them to be under control or purely for recreation. This might not be the case for others – usually their families who might see the use of drugs as too heavy or the use of any drugs as unacceptable. Something often happens which forces a person to think about their drug use. It could be a fight with a partner or friend, or a problem at work, which has come about because of their drug use. It could simply be a new year’s resolution or a decision to give something up for Lent. The drug is not yet seen as a serious problem for them. This is when the person decides to do something and makes the appropriate plans. They might tell a friend they are going to stop or reduce consumption. A word of warning to family members – the drug user may use this stage just to get you off their back. The person decides to do what he/she has decided. This may involve contact with a local community group responding to the drug problem or a statutory service provider such as the Health Service Executive. It is important for the family to note that while drug users must do this for themselves they do need as much support as the family can give. They keep up the action for as long as they can. This is often when the family can have an input into the care of their child. They have seen a positive move and can support it by understanding the problems their child is going through and helping to come up with solutions. Often people will find it difficult to maintain an action and will use again, sometimes at an increased rate and sometimes they may use just once. This can be more devastating for the family than an initial discovery. A year of watching the harm caused to a family member by their drug use can seem like a lifetime for a family but a year is nothing in the cycle of life on drugs. Neither is a year anything in the process of recovery. As time passes and families begin the process of recovery trust is rebuilt. The drug user begins to trust the family and the family begins to trust the user. When the drug user who has stopped using for months, or years, relapses and begins again, the pain for the family is worse than first time round. They can’t get rid of the feeling of disappointment, desolation and the terrible sense of failure as a parent. The mistrust, the fear, the anger and the grief are constant factors in the family home. The cycle starts over again. For everyone! Until at some point the parent begins to recognise the limitations of the family. The parent has to recognise their own limitations and, indeed the limitations of the family. Often it is another member of the family who says something inadvertently that will make a parent realise that he or she can do no more. Often is total exhaustion that makes a parent realise that he or she has to give the responsibility of getting off drugs back to the user. At this stage of acceptance, the family can begin to think about how best they can support the drug user living in the home or outside the home. We in the Network have found while we are supporting the drug user we ourselves need support. We found that the best way of getting this support for ourselves was through our Family Support Group. It is important that families have some hope when dealing with the process of addiction. While it is not within the Wheel of Change there is hope in the permanent exit. Some drug users when they receive treatment actually maintain whatever stage they are at and move on to the next stage and eventually reach the stage where they are clean of drugs. They continue to deal with their addiction and recovery through aftercare services, which many be provided by the agency that detoxed them or local groups. They also get support through self-help groups such as Narcotics Anonymous.